A HORRIBLE YEAR FOR FREMANTLE SOCIETY? I can’t let Lloyd Hammond’s claim in this week’s Fremantle Herald, that the Fremantle Society has had a horrible year remain unchallenged because it is factually wrong, and unfair to the hard working volunteers on the committee. It is surprising that Lloyd sees himself as an expert on the Society, and that the Herald takes his word for it, when Lloyd was only a committee member for 3 or 4 months before he dropped out because he could not spend the time. His ‘knowledge’ can therefore only be second hand. The Society launched the fascinating Fighting For Fremantle book by Ron and Dianne Davidson, it also launched the Freo Tribe blog and Planet Freo aggregator website. We had a huge week of events during the Heritage Festival, we also had stalls at events like the Blues&Roots Festival, the Hulbert Street Fiesta, the May Day celebrations, the Growers Green Sunday Market. We participated with a display at the Old Royal George artists’ exhibition at the Moores building. We organised a Day In The Life Of Fremantle WIKImedia event, where we uploaded hundreds of photos that are now an historic photographic record of Fremantle of that day, and we will participate with events in next month Fremantle Festival. And somewhere in between all that we published a lovely colourful brochure about the Fremantle Society, renovated parts of the Arthur Head cottage that became the headquarters in January, and organised sunset Bocce evenings at the cottage. And there is more! We wrote submissions to council, sat for hours at council and planning meetings, attended workshops, met council staff, gave media interviews, signed up new members, liaised with book shops, sold books, opened our meeting room for other community groups, etc. I believe those achievements would be the envy of many volunteer organisations, because it required dedicated and committed members willing to spend hundreds of hours doing those things for the community, instead of socialising with friends and family. I always enjoy having a chat and drink with Lloyd, but it is too easy for him to sit on the outside and criticise the Fremantle Society committee, when he himself could not find it within him to stay on and try to achieve the changes he might have liked to make. Did the Society have a perfect year and could it have done things better? Maybe we could have done more, communicated better internally, or do things differently, at times, but we worked very hard. We were out in the community showing a positive presence as often as we could and when we had enough volunteers to support us. Did we fail and have a horrible year? I don’t think so. The record speaks for itself. It has been a tradition for many years that I supply my friends with tips for the Melbourne Cup, so this year I looked deep and hard for clues all over Fremantle and beyond. I gazed at stars, looked into crystal balls and empty wine glasses, talked to psychics, mind readers, and horse whisperers, to make sure I was well informed. Let me make it clear that this year’s Cup race is more unpredictable than ever, and I personally blame Qantas for that. The Queen’s visit to Australia might also have upset some horses, paranoid of being bitten my Her Maj’s corgis, so it could get messy tomorrow at Flemington. * Americain does not do it for me. We used to have steak Americain in Holland when I was a child. It was minced meat, not horse I think. * Jukebox Jury will have many fans in retirement villages and RSL clubs, so lots of pennies will be put on her. * Drunken Sailor will have huge following at yacht clubs around the nation. It might have had a change if it could stand on two legs, let alone gallop on four. * Unusual Suspect is a great bet for the W.A. Police Force who will spend their well-earned CHOGM overtime money on this horse. * Presedence will be my bet this year, as trainer Bart Cummings always pulls a bunny out of the hat on big occasions. * Lost in the Moment is for the star gazing lovely Librans out there. It might not win, but it will still feel good to see it floating in the air. * At First Sight is a big no-no for me, as it reminds me too much of falling in love and broken hearts. * Tullamore needs dew, so for that horse the race starts far too late. It might have had a chance if the Cup was run at 6 a.m.
* Older Than Time. This world heritage listed horse will remain just an impressive part of Melbourne Cup history. Jockeys and trainers will tell you it’s all about one race at the time, while for those of us who speak horse language, the message is loud and clear that it is one stride at the time. Will you be much richer tomorrow just after noon W.A. time? Very likely in experience only, and you will tell yourself, like you did last year and the years before, to never bet on the Melbourne Cup ever again. Good luck and have fun! I’ll be at Fremantle’s Clancys of course. Likable Fremantle Herald reporter Brendan Foster has got a huge smile on his face. It’s a bit hard to see through the long hair, but it’s there! 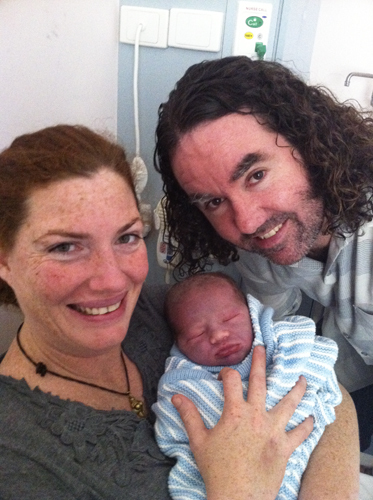 Brendan’s partner Melissa Cranfield delivered a perfect little boy named Frankie Rory. He is a great new addition to the two other children the couple already have. Babies are the true miracles of the world for me, so I can imagine the delight this new born has brought to the Foster/Cranfield mob. Congratulations!! Don’t miss the City of Fremantle COMMUNITY FORUM on the proposed inner city development scheme amendment! It is on TODAY! Monday October 31 from 6.30 at Victoria Hall. Come along and listen to what experts have to say, look at plans, models, etc. and ask questions. It is essential that the community shows strong interest in this, as the proposed new buildings would be of substantial height and bulk and will change the face of Fremantle forever. We need to make sure we get it right and have input into what will be built. There is no need for hasty council decisions we might regret later, so let’s sort out all the details, likes and dislikes, before going ahead. What a brilliant warm and sunny day it was in Fremantle for the annual BLESSING OF THE FLEET. The processions has been held here since 1948 and traditionally starts at the Basilica in Adelaide Street, from where it snakes through the city centre to the Fishing Boat Harbour. There the participants board the fishing boats and parade through the harbour, while fireworks are being let off at the Esplanade. It is a day full of big bangs, as the cannon is fired throughout the day, and the grand finale is another firework at 8 pm. The Blessing of the Fleet is a special tradition for Fremantle enjoyed by the whole community and visitors. 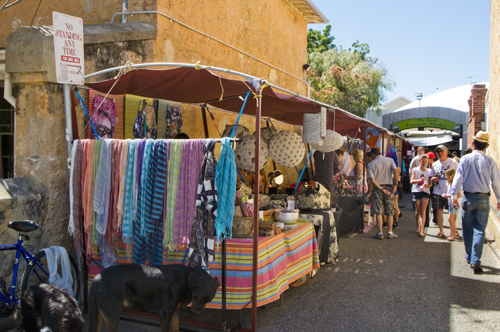 The Fremantle Markets have added a quirky little outdoor market in the lane way between the Henderson Street warders’ cottages, that leads to the Food Yard. A few colourful stalls enhance the area just opposite the great huge numbat mural that Belgian artist ROA completed only yesterday. Now if the W.A. State Government started the urgently needed renovations on the cottages, Henderson Street Mall could become a real feature for the city. When you wander around Fremantle this weekend, go and have a look at the huge 21 metre long mural artwork created by Belgian artist ROA in the Henderson Street mall, opposite the Fremantle Markets. It’s quite stunning. 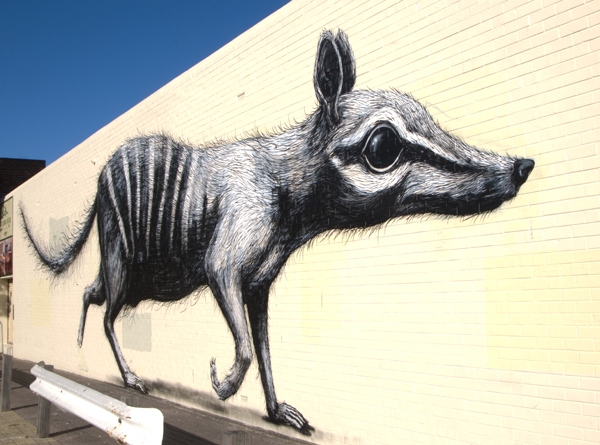 ROA was commissioned to do the work by the City of Fremantle, as part of this year’s Fremantle Festival. Sean Butler, the owner of he stunningly renovated and nearly finished NATIONAL HOTEL in Fremantle, needs a couple of million dollars to finalise the huge project, which could be done within six months. It appears banks discriminate against lending more, because of the building’s heritage characteristics, so they won’t hand over more money to get the job done. Sean also needs a new partner to buy out the present silent partner. Anyone with a wad of cash under the bed? Perth CHOGM party? 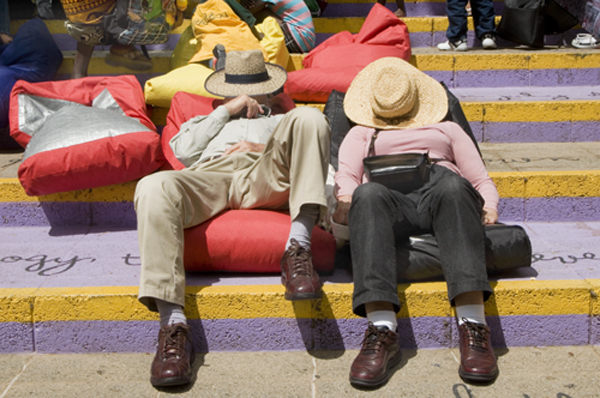 Who cares, when one can just relax in the sun and have a nap. Don’t miss the Fremantle Blessing of the Fleet tomorrow. It is a lovely tradition that I have photographed for nearly 20 years now, and I’ll be there again tomorrow and will post photos of it later on Sunday.